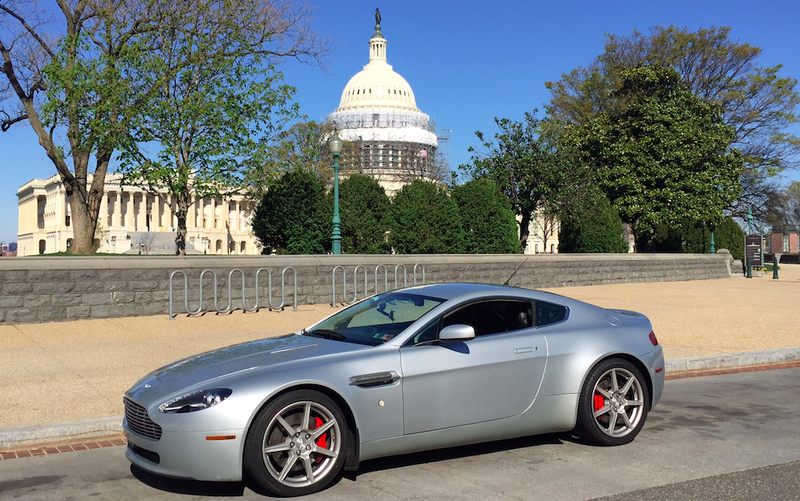 I Drove My Aston Martin Through The Nightmare Traffic Of Washington D.C. I recently had the opportunity to bring my Aston Martin to Washington, D.C. This involved spending two and a half hours on the interstate stuck behind people from Maryland going the speed limit in the left lane. Once I arrived, I met up with my friend Dave who helped me film the world’s worst video tour of Washington, D.C. I implore you to watch this video, gaze at our nation’s most important buildings, appreciate everything that D.C. has to offer, and ask yourself: was this video actually filmed by an adult orangutan? For those of you who don’t want to watch my video, I understand. You work in an office that prohibits excitement, such as wearing light-up shoes, or swearing when you get eaten by the Yeti in Ski Free. So instead, I’m going to just explain to you what it’s like to drive around Washington, D.C., in an Aston Martin. This isn’t really the Aston’s fault. Instead, it’s largely the fault of Washington, D.C., which is not only our nation’s capital, but also our nation’s capital of confusing roads and terrible drivers. It is also our nation’s capital of people who sell kielbasa outside government buildings. Allow me to explain the problem with driving in Washington, D.C. The primary issue is the infrastructure: it’s bad. And not “bad” as in it’s falling apart, but “bad” as in it was laid out with the same logic as airplane crash debris. Ironically, it was initially planned with great care, but that was before the automobile. Now, there are traffic circles that contain eight sets of traffic lights within the circle. This is completely true. Here’s another crazy thing about D.C. driving: I once made a wrong turn and ended up in another state. This actually happened. I was supposed to pick up my girlfriend somewhere, and I was five minutes away, and I made one wrong turn and I was in Virginia. And then I accelerated hard out of frustration and received a speed camera ticket. Think about that for a second. One wrong turn and I was out a hundred and fifty bucks and driving in another state. No matter what city people live in, they tell strangers on the Internet that their drivers are the worst. I often wonder if people in Mongolia are convinced that “Ulaanbaatar drivers are the worst,” except they don’t write it on the Internet but rather they chisel it in stone as they rinse their clothes in the river. Well, here’s the deal: Washington, D.C. drivers really are the worst. Not only is this statistically true, but it’s very obvious if you spend even ten minutes there. D.C. is a combination of drivers from the Maryland and Virginia suburbs, plus inner-city drivers, plus wide-eyed 24-year-olds from rural Kansas who are eager to change the world by working for some non-profit called National Organization for Clothespin Awareness, plus diplomats who drive according to the laws of their own country’s roads, which often involve a high volume of goat traffic. So driving the Aston there was not especially fun. What happens is, you accelerate for just one second, and then you’re mired in traffic. Or you start to push through a nice corner, and you find yourself stuck at one of the traffic circle’s eight stop lights. Or you go down a one-way street and you’re blocked by a Toyota Avalon with diplomatic plates coming the other way, and you have to move to the side because he has diplomatic immunity and he could slice off your ear this evening and be enjoying some nice Government Building Kielbasa by lunchtime tomorrow. This trip did, however, lead me to discover one great thing about the Aston: it’s an excellent highway cruiser. On the interstate, it’s smooth, and it’s stable, and it’s solid, and it eats miles like an expensive German luxury sedan. In fact, it ate about 400 of them on this one single trip, without a single hiccup or problem other than the fact that it accumulates brake dust at roughly the same rate southwestern Washington accumulated volcanic ash after the Mount Saint Helens eruption. Perhaps on my next trip to D.C., I’ll create a non-profit: the National Organization for Aston Martin Brake Dust Awareness. I will recruit several wide-eyed 24-year-olds from rural Kansas to work with me. Unfortunately, I suspect they will have trouble getting to the office, what with all the traffic circle stop lights.